In the late 80’s, my friend Stephan Ielpi, from the band False Prophets, introduced me to Alan Ginsberg. From that meeting, I immersed myself in Beat literature. As a result, in 1987, I purchased a copy of William S. Burroughs’ new novel Western Lands. The questers– Joe the Dead, Kim Carsons, the scribe Neferti, Hassan i Sabbah, the Old Man of the Mountain– travel through an unmistakably Burroughs-esque universe of appalling danger and otherworldly beauty– now the back alleys of ancient Egypt, now bombed-out Berlin, now the Old West of the shootist… And presiding over all is the haunting figure of the “old writer”, who shares the fate of his characters in being finally unable to write himself out of Time and into Space. Western Lands with German version of one of my Burroughs-esque stories. Over the next few years, as I moved from Philadelphia to San Francisco, I read everything that I could find by and on Burroughs. My notebooks from that time are full of attempts to write in a Burroughs-esque manner. Having read about his experiments in cut ups with Brion Gysin, I started doing them myself. I remember one Saturday in particular, sitting on my girlfriend’s bed, strips of newspaper and leaves from an old children’s adventure story spread across the covers. I kept putting pieces together and writing out the results until something that I felt worked emerged. Over time, I fell out of resonance with the content and themes of Burroughs’ work. I eventually stopped writing fiction and focused on the new technologies that were emerging at the time, such as desktop publishing and the web. I also returned to my love of history and began the research for what would eventually become my PhD. After being in London for a few years, I went back to my parents’ to go through the books that I had stored there. Most of them I had forgotten about or was not interested in any more, so I decided to sell them. I only kept three. Western Lands was one of them. At the time, I told myself that it was because it was a first edition. 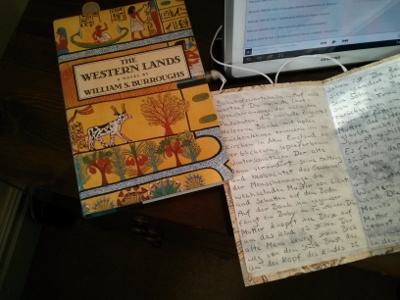 When I started writing Sea of Dreams, I picked up Western Lands for the first time in years. Rereading it, I realised that while I did not relate to the bleak tone and violence of the book, there was something that still resonated with me- the research and thought that went into creating the world of the book, the moments of beauty and simple pleasures, such as the writer finding the cat on Christmas Eve, and the imagination. Listen: I call you all. Show your cards all players. Pay it all pay it all pay it all back. For all to see. In Times Square. In Piccadilly. 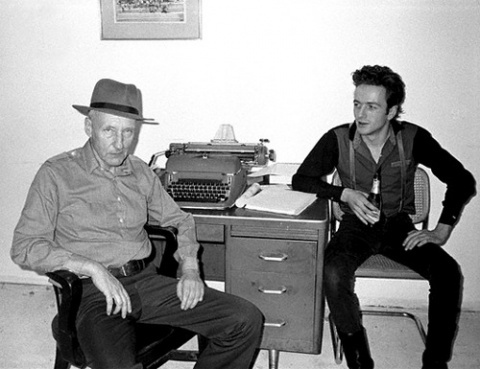 In the end, William S Burroughs was an Old Testament prophet- stern in his morality, eyes focused on the Truth, or at least the truth that he understood. He was a metaphysical writer, looking beyond this life… looking for an escape from death. He was searching for liberation through transformation. This search is why I kept Western Lands and why I still come back to his writing.